Did you read that book, The World Without Us? It’s about what would happen if humans disappeared off the face of the earth. Cities would rust, sewer systems would explode, parks would go wild. I’ve been thinking about what would happen if I disappeared–the bunnies would click on their lix-it bottles, the goats would quietly go feral, the bees would swarm over and over again. Knowing this, when I booked my trip to the East Coast, I began ferrying animals here and there. Which always gives me a heart attack. Last Tuesday I took Bebe and Ginger the goats to a gorgeous goat farm in Vacaville called Castle Rock. I popped them into a big dog crate and drove north. The scenery was gorgeous–green rolling hills, a farm with a bunch of white geese, old crumbling barns. My friends S and J came along because they were interested in goat breeding. Yep, Ginger and Bebe are getting knocked up. We released them out into the pack, and Bebe immediately began head butting everyone. Ginger puffed up. Establishing their rank in the herd. I think they’ll have a nice vacation. I mean, there are six bucks to choose from. The owner, Sarah, and I decided to hook Bebe up with a young buck named Harvey; and Ginger up with a dark and handsome Guy Noir. They’ll stay up there for about two weeks. For days after dropping them off, I thought I could hear them shifting around on the back porch, or nickering at night, begging for some oats. Just my imagination. Thursday I packed up all the rabbits, and relocated them to San Lorenzo. It must have made a funny sight, several cages stack up in my truck, with black and white rabbits hopping around. They seem happy with the new cages that we built at LaBrie Farm. I bought a whole watering system but couldn’t figure out how to keep it from dripping, so they’re all using bottle waterers until I can get back to fix it. The deck at my house is totally abandoned looking now. I’m not sure what to do with the new space. I was thinking about doing a deep clean, and building a cheese cave out there. It’s a constant 50 degrees no matter what season. Would definitely have to mouse-proof that. Saturday morning I planted every seedling that I had started. Green bean seedlings had been languishing on top of the duck car, in the garden there were some sad looking tomato starts, basil, and cauliflower, in the laundry room rampicante zuchinis and cucumbers. All planted and deeply watered in before our dawn flight to New York. I’m in New York still. I heard it rained in Oakland, so I’m imagining the green little ones speckled with moisture and loving it; the goats out in the peaceful fields getting it on; the bunnies snuggled up in the barn in San Lorenzo. Yep, I’m homesick. I’m reading in the DC area April 29, 7pm at the Arlington Public Library. Abeni and I had so much fun popping up at Samin’s Pop-Up General Store! We were there with a woman who makes amazing English muffins, an empanada maven, Samin’s dry goods counter (vanilla beans, high-quality cocoa powder), a kimchee goddess, and many many more food purveyors. 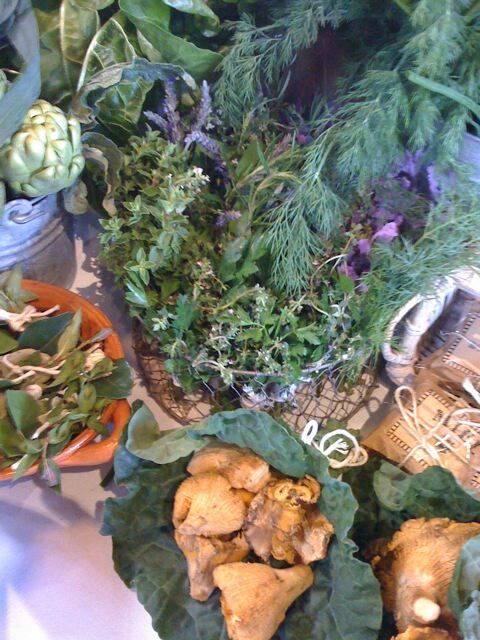 Since this was our first time, we brought a million things from the garden: favas, salad mix, braising mix, bouquet garni, artichokes, honey, candied fruit, leeks, and chantrelles wrapped in what we called a Hobbit shire cabbage leaf. Though we were proud of our bounty, next time at the General Store (we are invited back, right Samin? Right?) we might focus on just Ghosttown salad mix and candied citrus peels from the LaBrie farm. What would you like to buy at the next General Store? Thank you Janet Hankinson for taking the photos! Lord, the Fire Marshall came to the farm early this week. 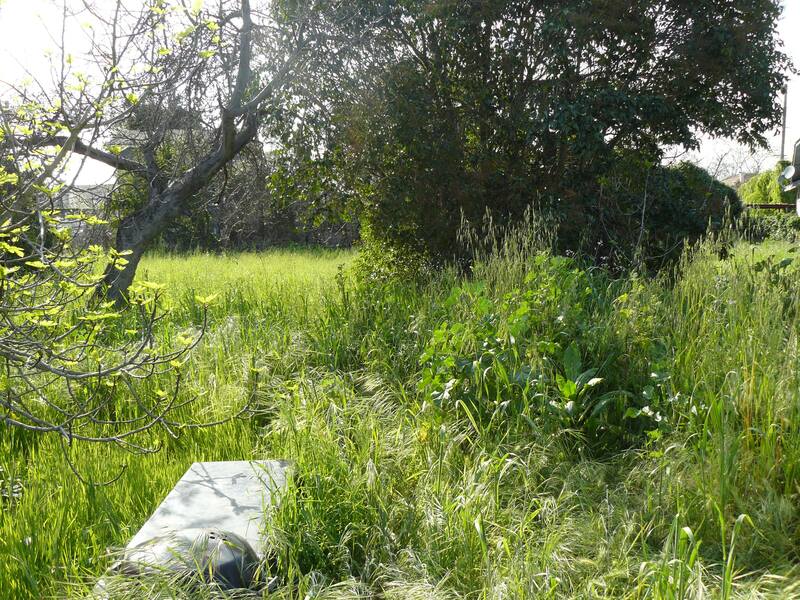 They’re doing an assessment of all the “vacant” lots in Oakland, looking for fire hazards. I saw them idling their truck at the gate, looking curiously in, so I walked up to ask if I could help them. He asked if I had the land zoned for agricultural use. Um, er…I didn’t even know that was an option. Long story short, I impressed him with my stripped car that is serving as a greenhouse, and told him I would clear away brush and other fire hazards. Before he left he said, “And no parties or events here. What if someone has a cigarette?” So there you go. I think I will NOT be building a cob oven out there this Saturday. Still, I will be popping up, and have the Pop-Up Farm stand on Sunday from 10-12 (note time change). I don’t want to risk getting busted, so it’ll just go for two hours. I’ll be selling pet food yogurt/cheese, favas, beets, leeks, tee-shirts, and books. See you there, and remember don’t park on 28th Street, park on MLK. Note: Unlike last time, I will not be doing tours. This is just a farm stand. You’re welcome to look around the garden but I’ll be focused on sitting behind the table and talking to people. As that one lady demanded last open farm: “I was told there would be animals!” There will not be animals, gotta wait until the next Open Farm day, which will be in July. 665 28th street, at Martin Luther King Way in Oakland. If you can’t make Sunday, I will be part of the Pop-up General Store at Grace Street Catering Tuesday 5-7. It’s a really fun food event, with lots of yummy goodies to be had. Plus, Samin is so rad. 4629 MLK at 47th Street. See you out there! And remember: no cigarettes. I’m ready to announce it to the world: I’m starting another urban farm. It’s in San Lorenzo (okay, maybe it’s a suburban farm…). One acre, a barn, with fruit trees and fields. 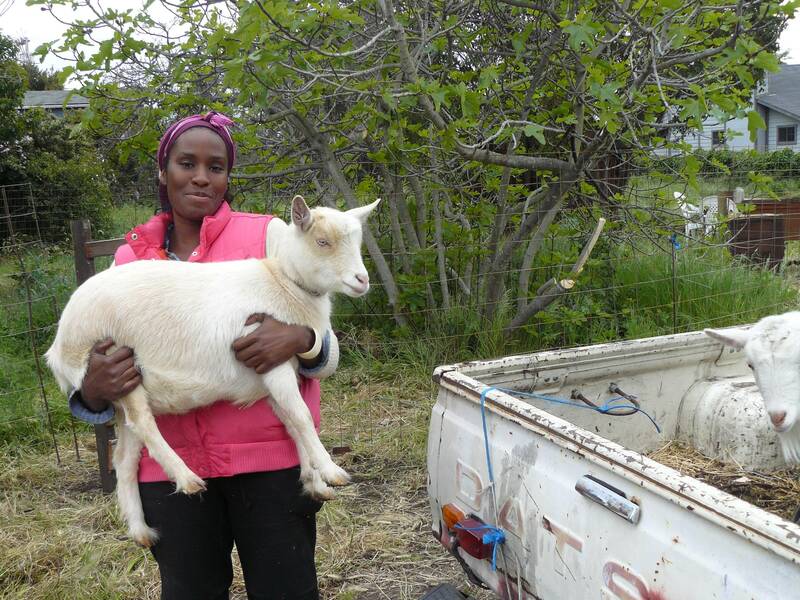 My farm partner, Abeni, brought some of the goats up today and installed them in their new digs. Read about it here, at the new blog, LaBrieFamilyFarm. There’s still so much work to do before we plant, but we’re just going there and working, not thinking about the endpoint. 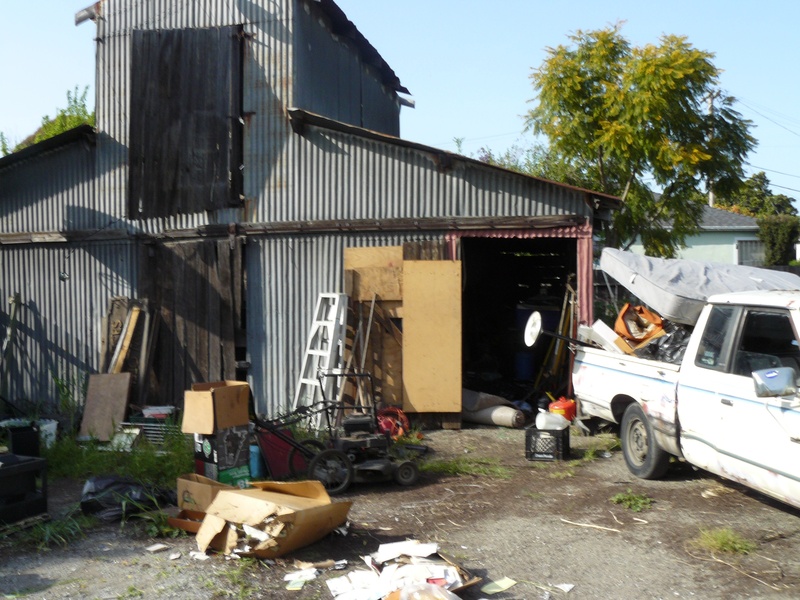 The biggest job was clearing out the barn, which we think was built in the 1940s. It had years of stuff in it, and opossums had taken up residence, so it was pretty gross. But now it’s great, and a good place for the goats to sleep and have babies. There’s a hayloft upstairs, which is perfect for storing alfalfa for the goats and rabbits. Karim and Jamila, our other partners in farming, are total bad-asses, and macheted down the grass in the fields. Check out how high the weeds were (photo below). The soil is very dark and rich. There are two fields, the north and south, each about a 1/4 of an acre. We’ve seeded a bunch of stuff off-site: tomatoes, herbs, peppers, onions, chard, cucs, and zuchs to transplant once we get the fields tilled. We’re specializing in French heirloom vegetables, but this first year we’ll be field testing a lot of things to see what our main crop should be. We’ll also be keeping honey bees. I’ve noticed a lot of fruit trees growing around San Lorenzo, so the bees will be happy there too. SanLor used to be a big ag hotspot with lots of small family farms. They would grow and harvest produce, then bring it to Oakland to sell from the back of the pick-up. 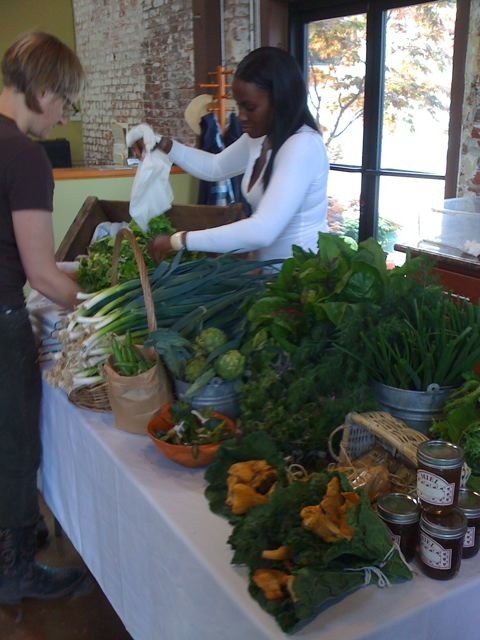 Which is kind of what we’ll be doing with the Pop-Up Farm Stand (BTW: April 11, 10-1 is the next one, here at G-T Farm). Everything old is new again.